Apple's BeatsX earphones are on sale once again at Best Buy and while it's not the biggest discount we've seen to date, it's worth a look. Some retailers are still selling the BeatsX earphones for around $150, but they're usually $120-$130. 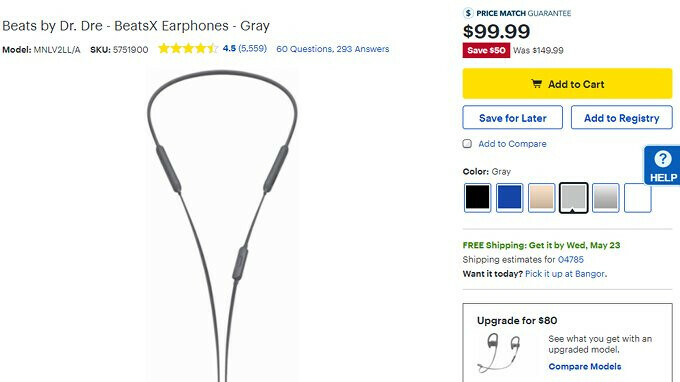 In any case, Best Buy offers Apple's BeatsX earphones for just $99.99, so, in theory, you would save $50 when you buy them. Even if you save slightly less than $50, buying these earphones for close to $100 is a good deal. The package contains eartips with four size options, a lightning to USB-A charging cable, a pocket-sized carrying case, the Quick Start Guide, removable secure-fit wingtips, and the Warranty Card. Best Buy has multiple color options available, including Blue, Black, Gray, Matte Gold and Matte Silver, so there's plenty to choose from if you decide to go for Apple's BeatsX earphones. Seen them on Amazon for 99 dollars too. Tempting but may get something that’s sweat proof. Yes,I also see 99 dollars on Amazon. Trash. Meanwhile even cheap 10$ Chinese bluetooth earphones have AptX codec, unlike Beats or AirPods. I understand their policy, but it's a joke that you can't listen high quality sound via Bluetooth with apple products. 256kbps is max (AAC). It's time for Apple to make an agreement with Qualcomm for using AptX HD technology or making their own hifi bluetooth codec. That's why even expensive Sony bluetooth headphones with iPhone sound not as good as with android phones.